ViVet is celebrating its first anniversary with the publication of a new regular feature highlighting innovators and influencers in the veterinary and animal health sector. We launched ViVet at our Innovation Symposium at the Warwick Business School in The Shard in September 2017, featuring a wide range of speakers drawn from the world of technology and innovation in areas such as healthcare, scientific research, business and finance and, of course, veterinary science. The ViVet programme itself grew out of the recommendations of the Vet Futures research project and is designed to ensure veterinary professionals are engaged with innovation and technological development in the animal health sector. Since it launched last year, this website has been publishing blogs and case studies and the team, led by RCVS Council member Chris Tufnell and Director of Leadership and Innovation Anthony Roberts, has been talking to audiences both within and without the veterinary professions about the project and veterinary innovation in general. Events spoken at have included the British Small Animal Veterinary Association Congress, Federation of Veterinarians of Europe Conference in Brussels and the Veterinary Public Health Association/ Association of Government Vets ‘Embracing Innovation’ Conference. 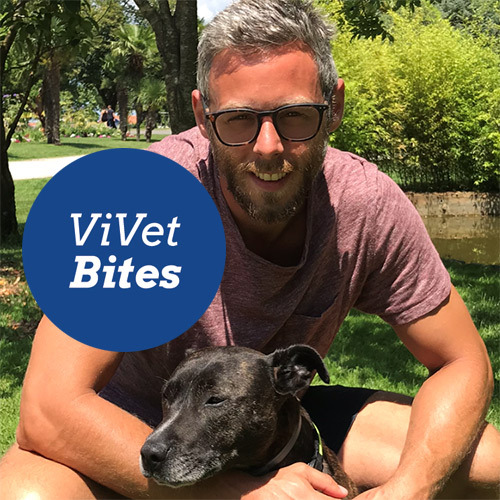 The first person to be interviewed for ViVet Bites is Sam Joseph, co-founder of StreetVet, which has some 300 volunteer veterinary surgeons and nurses providing free veterinary care to animals owned by the homeless community in a number of cities across the UK. In his interview Sam talks about how he and Jade Statt started StreetVet, his thoughts on the future of veterinary innovation and how vets can use their problem-solving skills to become innovators. A podcast and a webinar featuring Chris Tufnell and Anthony Roberts speaking about the ViVet project and what it means are also available to download from the resources section of the website.